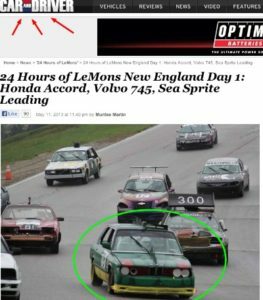 Two weeks ago I wrote about LaMent’s entry into the 24 Hour of LeMons race in Loudon, NH. The number one rule for The 24 Hours of LeMons is that you can’t spend more than $500 on your racecar. There are harsh penalties enforced if a team attempts to circumvent that rule: the race officials can dock the offending team a lap for every $10 they feel the team spent above the $500 limit and they can purchase that team’s car for $500. So go ahead and spend $1000 on your car. You’ll start the race out 50 laps behind and leave the race empty trailored. A team can’t dream of winning a race like this unless they have talent – talented drivers and mechanics. You have to be master mechanics to coax a jalopy to speeds exceeding 100 MPH for hours at a time. The race took place on the 11th and 12th of May. The team from LaMent’s Auto Repair, left Wayne, PA on the 10th. They formed a small caravan of support vehicles, with their lizard car attached to a trailer. LaMent’s was in fourth place at the end of the first day. They were in first place after the first hour of day two. Here’s the rub with the 24 Hours of LeMons: teams of all skill levels are pitted against each other. It’s one thing to have every day marathon runners in the race with world-class athletes (they wont see each other after the start). It’s another thing altogether to have to pass newbies and novices, lap after lap. If you live in the Main Line and are looking for a master mechanic, contact LaMent’s Auto Repair today. Laments Auto Service & Repair, Inc.
8 to 5, Monday through Friday. What Would Happen if You Didn’t Change Your Oil?